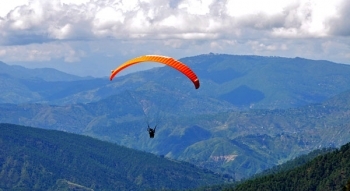 Wildrift Camp Purple is located 50 Kms from Nainital, Camp Purple is perched on the Mukteshwar ridge in the Sargakhet village. The camp is at 7290 ft and surrounded by apple and peach orchards and its name is inspired by the color which blends perfectly with nature as the sun sets (or rises) over the snow covered mountains. Kathgodam is the nearest railway station from Camp Purple in Mukteshwar which 66 Kms. Cabs and taxis are readily available at Kathgodam station to take you to the Camp Purple. Accommodation in Camp Purple is provided in American Safari Tents along-with camp cots, mattresses and sleeping bags ensure a comfortable stay in the wilderness. Toilet tents: Fully equipped with W/C toilets, running water flushes and toilet paper. 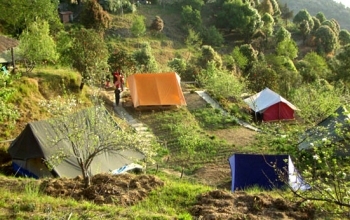 Bathing tents: Four tents with buckets, mugs and soaps and fresh running water. Wash area with wash basins, running water and mirror. There is a spacious tent equipped with modern facilities in Camp Purple, under hygienic conditions and infrastructure to provide Continental, Indian or Chinese cuisine along-with local delicacies. Bar-be-ques are also arranged around the campfire. Any special requests for food specifications can be made if advance notice is given. - Kite making & flying.